Apple MFi certification is a license ensuring complete compatibility when syncing & charging with your Apple device. MFi is an abbreviation for Made for iPhone, Made for iPad, and Made for iPod. 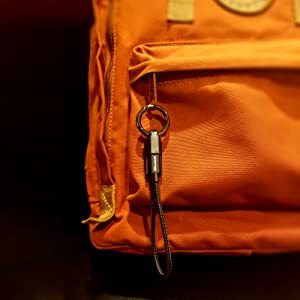 Short, travel sized, nylon braided Apple charging cord that comes with a keychain attachment. The perfect addition to your travel charging kit. 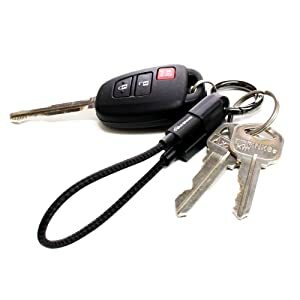 Attaches to your car keys, backpack or purse so that you always have a charging cord with you. Supports fast charge with Max 2.4 Amp charging capabilities from the 2.4A output USB port on wall chargers or car chargers. Built with high quality Braided Nylon Fiber Jacket that provides enhanced durability and increased flexibility to ensure a long lifespan and stable connection. 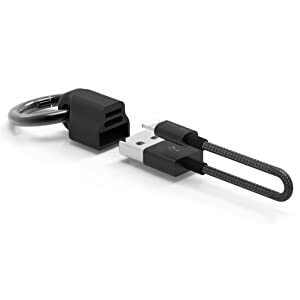 Apple MFi Certification ensures compatibility with all Apple devices that use a lightning connector. Never worry about an iOS update breaking your charging cable. Apple MFi Certified - Lightning to USB Braided Cable with Aluminum Housing, 4 Feet Pink Ednet - Smart Memory, Storage Extension for iPhone & iPad, up to 256GB, Rose Gold Apple MFi Certified - Lightning to USB Braided Cable with Aluminum Housing, 7 Feet Blue/Green Apple MFi Certified - Lightning to USB Sync and Charging Cable, Black 6.5 Ft.